Get your abs out of hiding with the Runtastic Six Pack app! Each core-focused workout can be done at home with no additional equipment – just you and your app! Lifelike avatars, Daniel & Angie, guide you through transformative abs workouts (that will set your abs on fire!). Plus, 50+ HD tutorial ab exercise videos help you maximize your core strength and overall fitness. 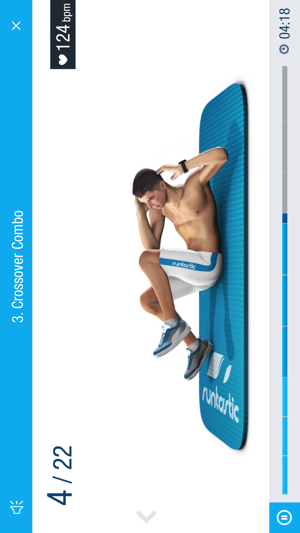 Get the Runtastic Six Pack app today & get your abs and core defined like never before! - Improve overall fitness, muscle strength & toning, stability and weight mgmt. - Plus, many more core and ab exercises to strengthen and define your abdominal muscles. Whether you’re a nutrition & fitness junkie, a busy stay-at-home mom or a business traveler who is always on the go – the Runtastic 6 Pack app is perfect for you and the best ab challenge out there! Each abs exercise will help you lose weight, ditch the belly & get the flat tummy you’ve always wanted. Follow our instructional ab workout videos & easy-to-use plans - anytime, anywhere. Remember: Don’t keep your hard work & insane 6 pack accomplishments to yourself! Share your completed sessions, “My Workouts” custom results and “Tip of the Day” favorites online via Facebook and Twitter. I love this app. I would like to see the developer allow the user to be able to work ahead of the virtual fitness instructor. Sometimes it is necessary to be able to move to the next set before the virtual trainer has completed the set. This is for two reasons: sometimes we are just faster then the V.T. or, we do not have time to complete a 28 minute an workout. Other than not being able to skip ahead in between sets, this app is awesome. Great job! Ad interruptions in the free version are very annoying. I was this close to deleting the app as my friends did but decided to try it a bit longer. I am happy I stuck that part out and paid. 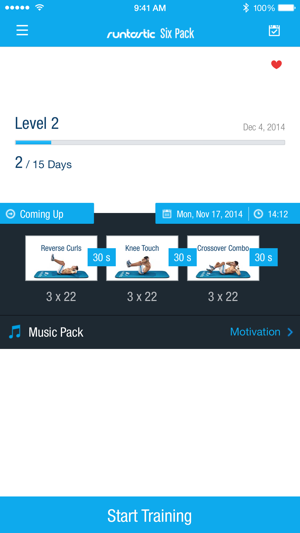 The exercise reps do not match the beat of my music as they do in the Easy Abs app. For hip-hop style music this throws things off, makes it hard to get a rhythm going to self-motivate and push through a workout. There is no music control to skip past a song in the playlist. I don’t feel like I should have to go into a separate music management app just to permanently remove a song because this app won’t let me get past it. If there is music control, that is super/bad because I can’t find it, I would rather believe the feature is missing. The video and voices are well done. The exercises seem to run the muscle-targeting gamut, also good, but I’ll need to stay with this more to see the full results. A good chiropractor will tell you to make sure your lower back is touching the mat which this ap fails to do. Some of the exercises are bad for your lower back. Hands shouldn’t really go behind your head doing sit ups, it’s your abs you want to workout not ripping your head off - fold your arms in front of your chest or better yet show the workout moves to your chiropractor.